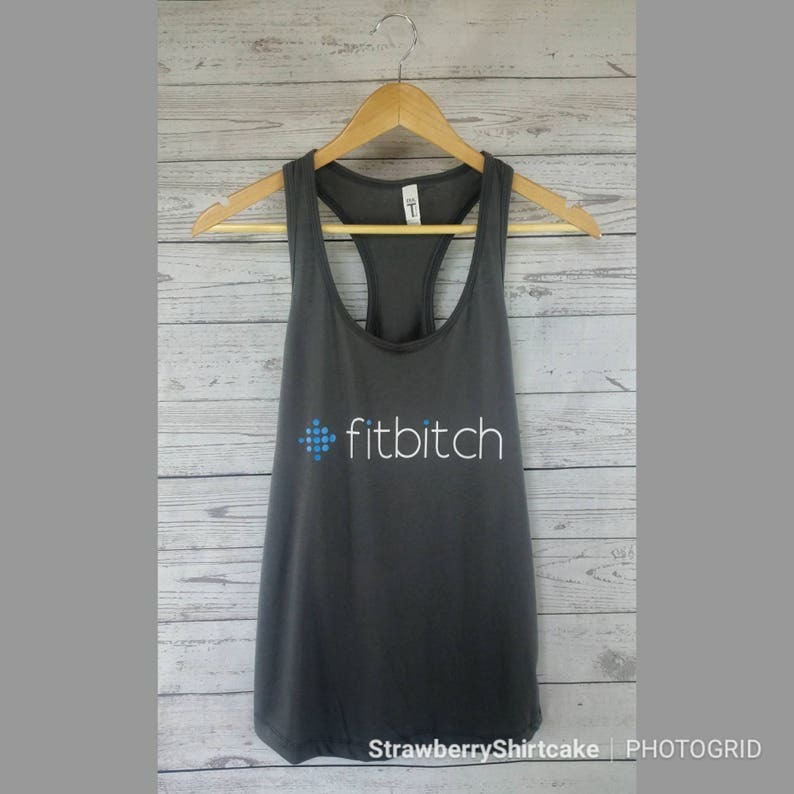 Women's workout tank top/Gym shirt-Fitbitch. Who says the gym can't be fun? 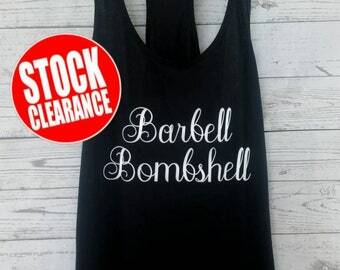 This lightweight women's racer-back tank top is perfect for working up a sweat in the gym while adding a bit of humor to your workout routine, or for everyday wear. Each shirt is made by myself in a smoke free, pet free home. CUSTOM ORDERS WELCOME! 23 shirt colors available*: Black, Banana Cream, White, Hot Pink, Cancun, Dark Gray, Heather Gray, Indigo, Kelly Green, Light Orange, Lilac, Midnight Navy, Military Green, Mint, Purple Rush, Raspberry, Red, Royal, Scarlet, Silver, Tahiti Blue, Turquoise, Warm Gray. *I currently keep 17 colors in stock on a daily basis but feel free to message me if you have your heart set on one of the other 6 colors and don't mind waiting till my next shipment of shirts and I'd be happy to make it work for you. I also add new colors regularly. 6 sizes available: XS, S, M, L, XL, 2XL (These tank tops are true to size but meant to be fitted across the chest and loose fitting across the midsection so if you want it to be loose all over you may want to order a size up, or vise versa if you want it fitted all over consider ordering a size down). 5 vinyl colors available: Black, White, Gold, Rose Gold, Red. If you have a particular vinyl color you would like please leave a note specifying which color/colors you would like. If no note is left than I will choose which color I feel looks best on the color of shirt ordered. This may or may not be the color shown in the product photograph. Care instructions: Turn garment inside out to wash. Machine wash cold, mild detergents, non-chlorine bleach. Tumble dry low. Do not iron decoration. Do not dry clean. Fantastic item, good quality, loved the little surprise the seller added too! Highly recommended. Cute tank! Very fast shipping! I am always happy to create a custom design for you or your company at no additional charge. If you are interested in altering one of my current designs or want to start from scratch feel free to reach out to me and we can make it happen! In regards to custom shirt colors or styles that I do not keep in stock (not listed on my drop down menu) I'm always happy to add on a custom color or style when I'm placing an order to stock shirts at no additional S/H cost (there may be an additional charge if you are purchasing a different style to cover the difference in material cost). I generally place an order about once a month, if you cannot wait until I'm placing my next order you can purchase a custom shirt for an additional $11 S/H cost. Is your group or company looking to purchase a large quantity of shirts? I gladly take wholesale orders and offer discounts on a tiered system. As always there is no additional charge for custom designs. These tank tops are true to size but meant to be fitted across the chest and loose fitting across the midsection so if you want it to be loose all over you may want to order a size up, or vise versa if you want it fitted all over consider ordering a size down. 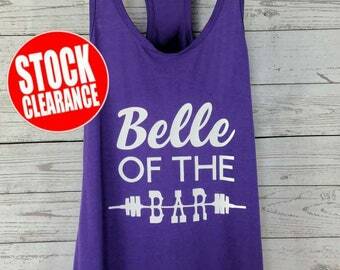 Womens workout tank. Womens workout shirt. Workout tank for women. Workout shirt for women. Funny. Fitness. Workout. Tank. She Wants The D.